Fill out our simple form and get quotes from local afternoon tea caterers. Elegant and quaint, afternoon tea catering lends itself so well to so many different events. From lighter options for small gatherings to decedent and luxury afternoon tea wedding catering, this very British catering option will always keep your guests sweet. We can produce a high quality homemade Afternoon Tea with a selection of fresh sandwiches, cakes, scones, pastries and biscuits. We can also offer a Vintage Afternoon Tea too! Our lovingly prepared Afternoon Teas are all served on vintage crockery catering for parties from 8 to 100 perfect for hen parties, special birthdays or weddings. Traditional afternoon tea or with a twist - have it your way! Full crockery and cutlery can be provided. We are 'bespoke event caterers', our produce is always fresh, organic and sustainable, as well as locally sourced from the wonderful farmers' markets of Kent. Real Devon cream served on freshly home baked scones with jam and tea or coffee, and other options available. This may include items such as cake stands, tea cups and plates. Some afternoon tea caterers may have a lower price for any children's meals. If there will be no children, please leave blank. This could help you to receive more quotes. There’s more to a good afternoon tea than dainty sandwiches and cute cakes (although we love both of these things!) 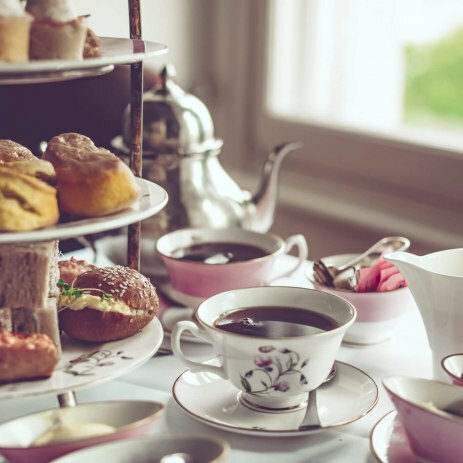 The popularity of the vintage afternoon tea party has made caterers more creative, and you’ll find a fantastic amount of options, extras and themes as well as beautiful presentation. Team your afternoon tea catering with vintage crockery hire for the ultimate celebration of chintz and all things sweet. Whether you’re looking for afternoon tea wedding catering for your big day, a birthday party, baby shower or even a funeral, this chic and refined catering option is a firm favourite. Let our tea party catering suppliers create you a tailored package perfect for your event. Simply complete a quote request form and hear back from afternoon tea caterers in your area.